The many autumn leaves spots in the Kanto region are famous sightseeing places, and you can enjoy various activities and combinations with hot springs. Promenades and park facilities are well developed and many light up events can be seen. Ginkgo trees attract your attention in the plains. 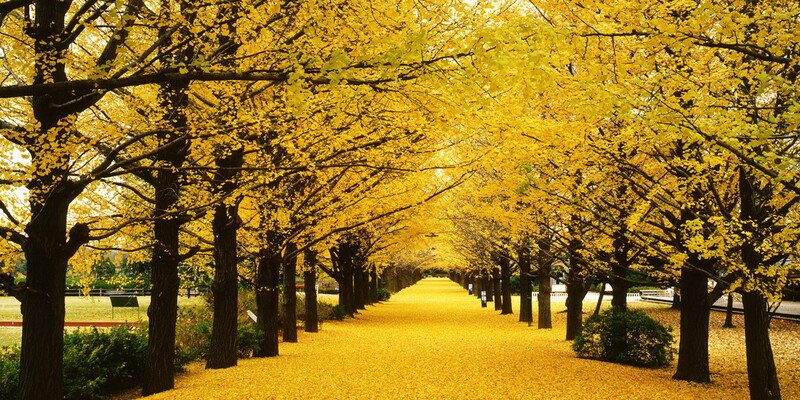 It is a tree often planted for fire protection purpose because it contains a lot of water, but rows of ginkgo trees are graceful and brilliant in autumn. There are a number of spots for autumn leaves worth seeing are scattered in Nikko. Autumn leaves begin with grass autumn foliage in Odashirogahara and Senjogahara of Okunikko and go down to Lake Chuzenji and famous ancient temples of world heritage. Nikko has a large altitude difference, and from early October in Okunikko to the end of November around shrines and temples in Nikko, autumn leaves can be enjoyed for about two months. On the Chuzenji Lake at an altitude of 1269 m, maple, beech, and laquer beautifully dye lakeside red and yellow. In the background of Mt.Nantai rising majestically, the lake surface reflects autumnal leaves and it gets dyed in brocade. Exquisite scenery in autumn that you can get on a pleasure boat from the lake is exceptional. Kegon Waterfall where the water of Lake Chuzenji runs down, and Iroha- zaka slope which connects Lake Chuzenji and the city of Nikko are also popular autumn leaves spots. If you ride the Akechidaira ropeway in the middle of the second Irohazaka slope, you can overlook the magnificent panorama of Mt. Nantai, Lake Chuzenji and Kegon Falls below your eyes. In November, the shrines and temples of Nikko are lighted up, and you can enjoy the fantastic nighttime autumn leaves which are different from the daytime. Mt.Tsukuba looks good from anywhere and has a great view from the summit because it is rising in the Kanto Plain. It has been loved by people since ancient times, and 25 poems of choka/ tanka are composed in ""Manyoshu"". It consists of two peaks of Mt.Nyotai with an altitude of 877 m and Mt. Nantai of 871 m above sea level. Cable cars and ropeways offer easy access to the top of each mountain. 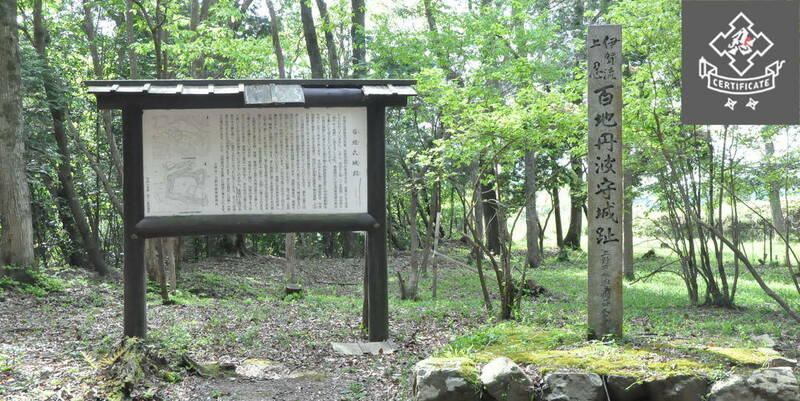 The summits of the two peaks are connected by a promenade of about 850 m, and beech forest which can be rarely seen in the Kanto region are growing around there. Including the beech forests, a wide variety of trees such as Ilohamomiji, Quercus crispula, Mayumi, and lacquer are growing along the mountainside, and colorful autumn leaves are spreading. 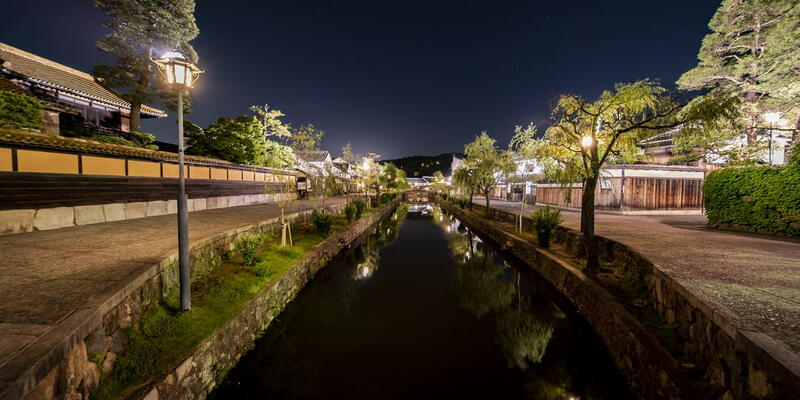 Nighttime operation and light up of the cable car are held every year to match the best time for autumn leaves, and Momiji is often seen along Miyawaki station at the foot of the mountain and on its railway line, and emerges beautifully in lighting. The night view of the Kanto Plain is also impressive when overlooking from the observation deck at the summit station. 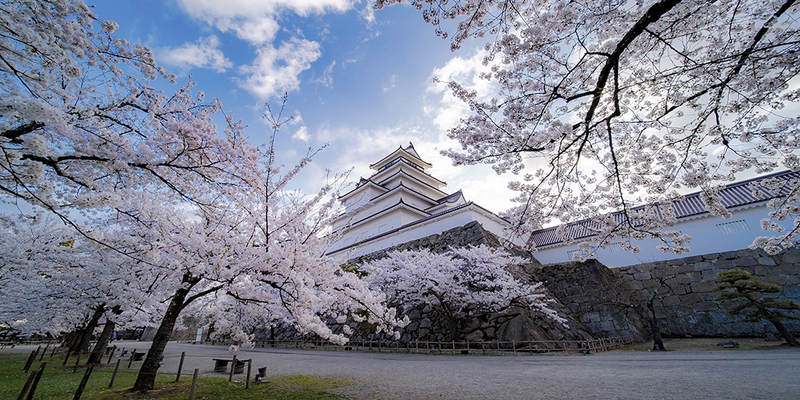 Nagatoro has abundant nature spreading around the valley of the upper Arakawa river. 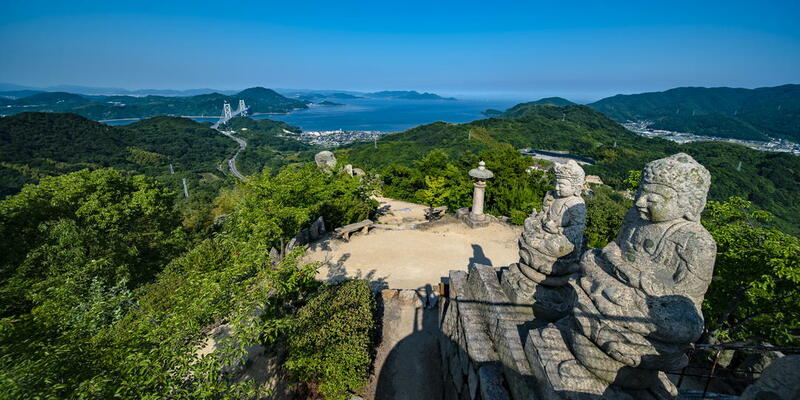 It is said to be ""the birthplace of geology in Japan"" because the distinctive wonders such as the nation designated scenic spots and the natural monument ""Iwadatami"" and ""Chichibu Red Wall"" are seen and the crystalline schists are exposed from the deep underground. The Arakawa river around ""Iwadatami"" is a ""Toroba"" where water stagnates and shines blue, and activities like river boating and rafting are popular. In autumn, the contrast between odd rocks and autumnal leaves such as Momiji, Japanese oak and sawtooth oak is wonderful by the riverside, and viewing the fall foliage from the boat down the river is rich in Japanese atmosphere. For the view point of autumnal leaves, I recommend the vicinity of ""Iwadatami"", and ""Tsukinoishi Momiji Park"" where various broadleaf trees, mainly Momiji turn colorful. Every November, the ""Nagatoro Fall Foliage Festival"" is held, and the ""Tsukinoishi Momiji Park"" is lighted up gorgeously at night when it is colored in red. Watarase river is flowing while forming a scenic valley on the east side of Mt.Akagi. Takatsudokyo known as ""Yabakei in Kanto"" is located near Omama station in Gunma prefecture, and you can enjoy the dynamic scenery of the valley with odd rocks in a row and autumn leaves of the mountain surface dyed in rich colors from the top of the bridge over the valley. In addition, along the valley, the retro trolley train of Watarase Keikoku Railway runs slowly from Kiryu station in Gunma prefecture to Mato station in Tochigi prefecture. 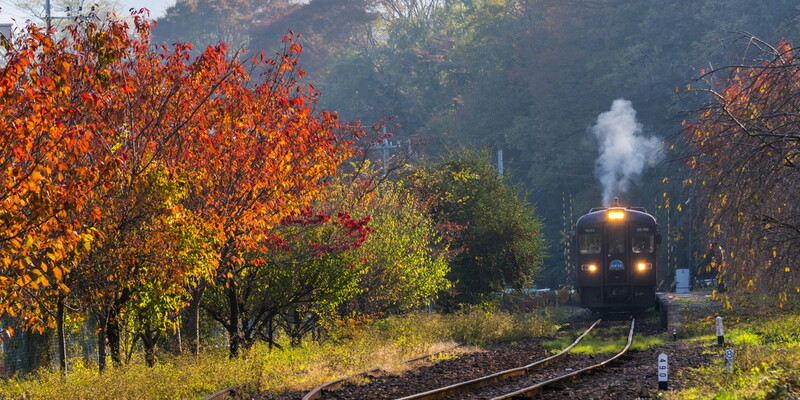 On an open-type trolley train with no window glass, you can experience the nature of the valley first-hand, and enjoy a local line trip while watching the scenery of the valley and autumn leaves. On the railway line from Tsudo station to Ashio station in Tochigi prefecture, you can see the scenery of Ashio town once flourished with Ashio Copper Mine. In the town surrounded by colored mountains, the ruined mining facilities and mine houses still remain and the nostalgic autumn landscape is unforgettable. In ""Ashio Copper Mine Tour"" utilizing the remains of the galleries, you will remember the ancient time of the copper mine that lasted more than 360 years. 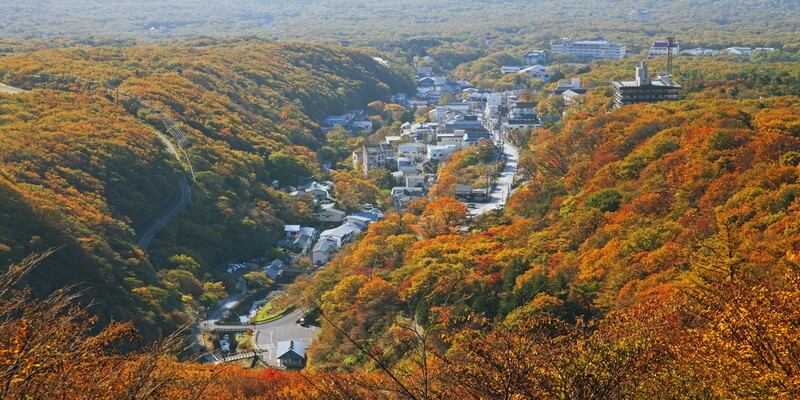 【Nasu Highlands】 Moved by the majestic autumn leaves of the Nasu Mountain Range and the old trees of the hot spring town! 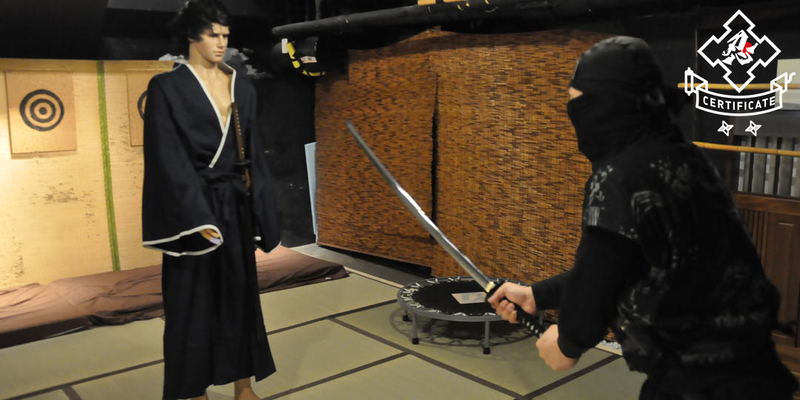 Nasu Highlands are the ""Royal resort"" where the imperial family also rest. In the background of the main peak of the Nasu Mountain Range · Mt.Chausudake trailing volcanic smoke, the deep forest spreads at the foot of the mountain as far as you can see. Mt.Chausudake has conifers of Veitch’s bamboo and Japanese stone pine mingled with deciduous trees such as Momiji, rowan, birch and Enkianthus perulatus, and red, yellow and green colors show beautiful contrasts. 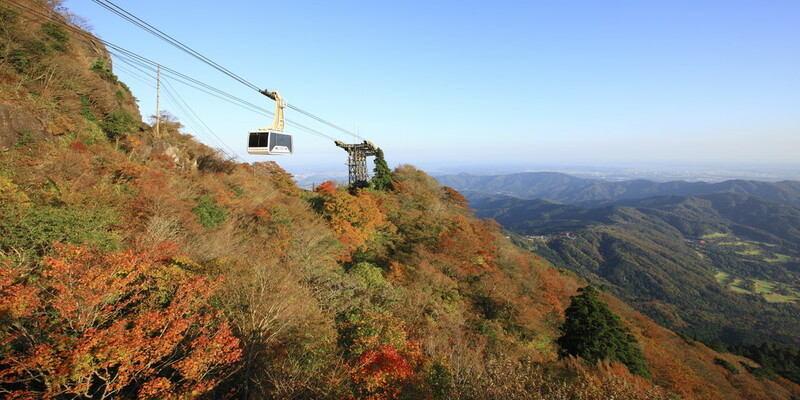 A ropeway runs up to the ninth station of Mt.Chausudake, and you can enjoy an aerial walk with the autumn leaves below your eyes. Autumn leaves will come down to the spa town at the foot after mid October when autumn leaves on the hillside are over. The surroundings of Nasu Onsen shrine associated with Nasu no Yoichi and Sessho-seki(killing stone) where the nine-tailed fox legend remains are the popular autumn leaves & power spots. The presence of 800-year-old big sacred trees of Quercus crispula in Nasu Onsen Shirine is overwhelming. Showa Memorial Park is a state-owned park built to celebrate the 50th anniversary of the Emperor Showa. With various facilities scattered on a vast site, it is the largest leisure spot in the metropolitan area. Yellow ginkgo leaves play the leading role in the park in autumn. There are 106 ginkgo trees at both sides of the canal just off the Tachikawa exit, and 98 ginkgo trees line up neatly both in the Undo square and on the side. In addition to ginkgo trees, maple, cherry trees and Japanese zelkova are colored everywhere in the park, and you can see colorful carpets of fallen leaves piled on the lawn. Red and yellow Moiji and Enkianthus perulatus are very tasteful in the Japanese garden. The scenery of symmetrical autumn leaves which are beautifully arranged makes you feel the calculated beauty which autumn leaves of a virgin forest doesn’t have. Mt. 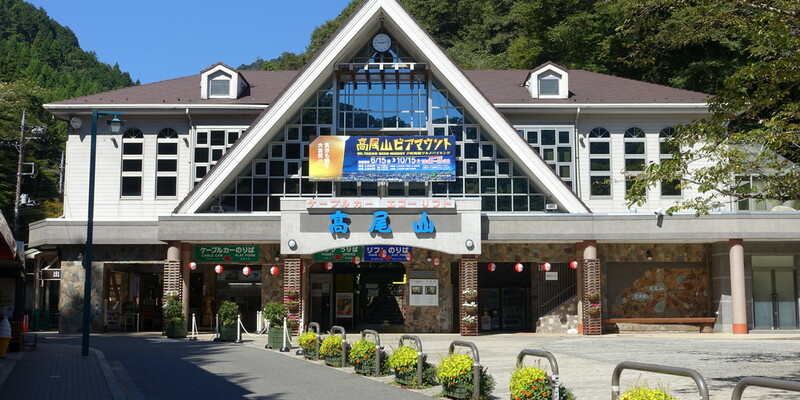 Takao is at an altitude of 599 m, where you can enjoy mountain walking easily on a day trip from the city center. Natural forests remain because of having been preserved as a sacred mountain for a long time, and various vegetation forms a colorful autumn landscape. Omomiji, Irohamomiji, beech, Rhus trichocarpa vividly turn red leaves, especially the Momiji community in the vicinity of Momijidai near the summit is exceptionally beautiful. The railway line along the cable car that connects Takao Station at an altitude of 472 m from Kiyotaki Station at the foot will also become a colorful tunnel with autumn leaves of Irohamomiji, Omomiji, Kajikaede etc. From the observation deck near Takao station, you can see the majestic panorama overlooking the Kanto plain. The old temple of Yakuoin standing halfway is known for the tengu faith, and its vicinity is also a red leaves spot which is worth seeing. Colored leaves vividly shine in the Garan such as Shitenno-mon gate, the stone statue of tengu and richly colored Gongendo. Every November, ""Takao Momiji Festival"" is held, welcoming people who visit various events.